In other words, Couric, in the ultimate example of false balance–Couric believed that both sides of a scientific “debate” are equivalent in quality of opinion and evidence. But rarely is this true, especially in scientific principles that have been well-studied and supported by a massive amount of evidence. The safety and efficacy of vaccines is supported by the vast consensus of real science. The antivaccination side has no evidence, so it must rely upon logical fallacies and cherry picked data, and lack any real, world-class contingent of scientists who have stepped up to change the consensus with real evidence. 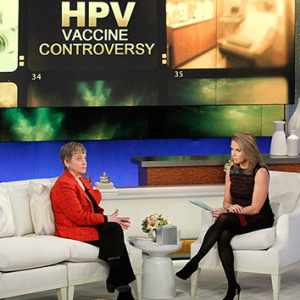 Couric’s Gardasil episode blew up the interwebs. Blogs that don’t generally cover the the stupidity of the vaccine deniers, jumped all over her irresponsible story. Tara Haelle, in her article, Oh Katie Couric, let us count the ways you screwed up HPV vaccine coverage, reviews much of what was said on the interwebs about Couric, Gardasil, and the state of science journalism. While many appreciated us raising the topic, others were critical of us for providing what they felt was a disproportionate amount of time to two families who faced the rare circumstances of seeing their children’s health deteriorate after receiving Gardasil. The health problems may or may not be linked to the vaccine. For those of you who watched the show, you know we presented the facts supporting the potential of the vaccine and that Katie’s own daughters received the vaccine. This is an important personal decision to be made in consultation with your doctor and other family advisors. The CDC says the HPV vaccine has been used in the US and around the world and has been very safe, however, any medicine could possibly cause a serious problem. They also state the risk of any vaccine causing a serious injury or death is extremely small. We do not want to leave our viewers with an irrational fear of the vaccine and for that reason we’re going to continue the conversation and invite a number of medical experts, journalists and scientists to weigh in here, on our site. We’ll keep you posted! Here’s the problem. She states that “a disproportionate amount of time to two families who faced the rare circumstances of seeing their children’s health deteriorate after receiving Gardasil. The health problems may or may not be linked to the vaccine.” What rare circumstances? Two massive studies published in major medical journals show no significant and serious adverse events from Gardasil. These are controlled studies where causality between Gardasil and individual medical events were explored. The risk of using Gardasil is negligible, not “extremely small.” The problem isn’t what Couric believes (she claims to have had her children vaccinated with Gardasil), it’s how she presents it. She gave air time to two families, who pull our heartstrings, and failed to give adequate time to boring, but ultimately factual, scientific data about the safety and efficacy of Gardasil. This is the fundamental definition of false balance. So Couric’s producers seem to think that the way to address their grievous treatment of an important public health issue is “to continue the conversation and invite a number of medical experts, journalists and scientists to weigh in here” — because CLEARLY letting experts, journalists and scientists comment on a webpage is just as good as devoting a major portion of a daytime TV show to inaccurate, misleading scare-mongering. Yes, the statement does repeat what the CDC claims about Gardasil, and all vaccines. No medical procedure, none, is without risk. It’s all about the simple math of risk versus benefit. IF Gardasil had a 1 in 1 million risk of some serious adverse effect (and even that level has not been uncovered by epidemiological studies), the lifetime risk of contracting cervical cancer alone (ignoring all other cancers caused by HPV) is around 6.0 per 1,000. Furthermore, the lifetime risk, for each woman, of death from cervical cancer is around 2.0 per 1,000. In other words, the risk of death from cervical cancer is nearly 2000X higher than even the imaginary (and scientifically unsupported) assumed 1 in 1 million risk of serious adverse effect. These are not complex mathematical comparisons. They are not minor clinical observations. A 1000X higher risk of cancer vs. adverse effects is substantial and one that should be taken into consideration by anyone discussing HPV vaccines. Did we hear these facts from Couric? Of course not, because that would have ended the story being pushed by Couric. One of the worst parts of Couric’s statement is that it mentions Dr. Diane Harper, not by name, but by the “doctor who oversaw the clinical trials of Gardasil,” who appeared on the show. She did have role in the Gardasil research, but it is an overstatement to say that she “oversaw” the research. And as I’ve said, she’s still deeply involved in HPV vaccine research, with papers published recently, and has never said that the vaccine is unsafe or ineffective. If she’s the best that the antivaccine forces have in condemning Gardasil, then they’ve failed. Moreover, we have substantial knowledge about how the adaptive immune system behaves over time in response to viruses, especially ones like HPV that do not necessarily mutate frequently. We can predict, and one of the cornerstones of good science is the ability to predict, that the vaccine will maintain its effectiveness over time. Consequently, as science continuously examines this issue, one of two things might happen: we could find out that it is effective over a long time, or we could determine that we need a better vaccine or more frequent boosters. So the hypothesis that the vaccine’s effectiveness lasts for a long period of time has not been refuted by anything presented by Dr. Harper. Pap smears don’t help diagnose all of the other HPV-related cancers, most of which are just as dangerous, just as serious as cervical cancer. This isn’t just an oversight by her, this seems like an intentional attempt to shift the discussion from all of the cancers prevented by the vaccine to just one. Harper argued that of pap smears, in combination with HPV DNA testing, could catch all cervical cancer cases. She claimed that this is 100% accurate. Even though they are really very accurate, they are certainly not “100%” accurate. Personally, for my daughters and loved ones, I would prefer they prevent the cancer rather than being diagnosed for it, which, depending on a variety of conditions, could require serious medical procedures. I’m not sure why Dr. Harper denies parts of her medical training to provide this succor to the antivaccination crowd, but it’s frustrating. It’s obvious she doesn’t think the vaccines are as dangerous nor as ineffective as the deniers say, because she has peer reviewed articles published as recently as Summer 2013 that illustrated her involvement in the positive aspects of HPV vaccines. She has provided some rational discussion about the cost-effectiveness of the vaccine, but apparently she has fallen for the antivaccination gang’s flattery. Again, Dr. Harper isn’t all what the vaccine deniers think she is for their cause since she never criticizes Gardasil for safety issues. But I cannot in good conscience excuse some of her public comments, despite the fact that they are so nuanced, when you get to the core of what’s she’s saying, she still a supporter of the vaccine. But it’s sad that she has fallen off the rails in her apparent desire for fame with the antivaccination crowd. Speaking of falling of the rails–Katie Couric has lost substantial journalistic credibility with respect to science reporting (if that even matters to her or her audience). She chose the false balance route of reporting by giving significantly more time to heart-wrenching, but ultimately irrelevant, stories about HPV vaccines. But she gave not one second to someone who had to deal with cervical cancer. Or to interviewing the 50 million or so kids who received the vaccine without any problems. Or to the huge numbers of knowledgeable people in the pro-science community who understand the extremely high level of the scientific consensus about vaccines.